Alexander Arrasi Agase (March 27, 1922 – May 3, 2007) was an American football guard and linebacker who was named an All-American three times in college and played on three Cleveland Browns championship teams before becoming head football coach at Northwestern University and Purdue University. Agase grew up in Illinois and attended the University of Illinois, where he was a standout as a guard starting in 1941. He was named an All-American in 1942. Agase then entered the U.S. Marines during World War II and played a season at Purdue while in training. He was again named an All-American in 1943. After his discharge from the Marines, he came back to Illinois and played a final season in 1946, after which he was named an All-American for a third time. 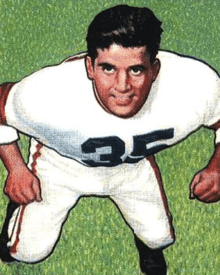 Agase began his professional football career with the Los Angeles Dons of the All-America Football Conference (AAFC) in 1947, but was soon traded to the Chicago Rockets and then the Browns, where he remained until 1952. Cleveland won two AAFC championships and one National Football League championship while Agase was on the team. After retiring from football, Agase was worked as an assistant coach for the Dallas Texans and, after a brief return to playing for the Baltimore Colts, Iowa State University. He was hired as an assistant at Northwestern in 1956 under head coach Ara Parseghian. Agase remained as an assistant until Parseghian left to coach at Notre Dame in 1963 and he was named the new head coach. Agase guided the Northwestern Wildcats to a 32–58–1 win-loss-tie record in nine seasons. He was named coach of the year by the Football Writers Association of America after guiding the team to a 6–4 record in 1970. Agase left to coach at Purdue in 1972, but none of his teams posted a winning record there, and he was fired in 1977. He then spent six years as athletic director at Eastern Michigan University before retiring. Agase died in 2007. He was inducted into the College Football Hall of Fame in 1963. Agase was born in Chicago to an Assyrian father, Charles Agase (1883-1959), and an Armenian mother, Elsie Darwitt (1892-1971). Both were born in Persia. He attended Evanston Township High School, but only played on the school's varsity football team in his senior year. After graduating, he attended the University of Illinois and played college football there as a right guard in 1941 and 1942. In a 1942 game against the University of Minnesota, Agase scored two touchdowns for the Fighting Illini, becoming only the second guard in college football history to accomplish that feat. The first touchdown came in the second quarter, when Agase stripped the ball from Minnesota's Bill Daley and ran it back 35 yards. The second was a fourth-quarter fumble recovery in the end zone to give Illinois a 20–13 victory. In another game against Great Lakes Naval Training Station, a military team, Agase had 22 tackles. Under coach Ray Eliot, Illinois finished the season with a 6–4 win-loss record. Agase was named an All-American after the season. Agase entered the U.S. military in 1943 as America's involvement in World War II intensified. He was sent to Purdue University for training in the U.S. Marines and played on the school's football team along with enlistees from other schools. Purdue had won just one Big Ten Conference game the previous year, but the influx of trainees including Agase led to a reversal of fortune in 1943. Coached by Elmer Burnham, the Purdue Boilermakers won all of their games that year and were named Big Ten co-champions. Agase was again named an All-American. During the following two years, Agase served on active duty in the war. He participated in the battles of Iwo Jima and Okinawa, where he received a Purple Heart after he was wounded in action. He rose to the rank of first lieutenant. Agase returned to Illinois in 1946 and rejoined a Fightining Illini team that posted an 8–2 record and was ranked fifth in the nation in the AP Poll at season's end. Illinois beat the University of California, Los Angeles in the Rose Bowl Game after the season. Agase was named an All-American for a third time, and received the Chicago Tribune Silver Football as the most valuable player in the Big Ten. Agase had been selected by the Green Bay Packers in the 1944 NFL Draft, but military service delayed his professional career. Although Green Bay still held the rights to him when he graduated from college, Agase instead signed in 1947 with the Los Angeles Dons of the new All-America Football Conference (AAFC). Agase, however, played just three games for the Dons before he was traded in September 1947 to the Chicago Rockets, another AAFC team. The Rockets finished the season in last place in the AAFC's western division with a 1–13 record. The Rockets traded Agase and fellow lineman Chubby Grigg the following year to the Cleveland Browns, who had won the AAFC championship in each of the league's first two years of play. Led by quarterback Otto Graham, fullback Marion Motley and ends Dante Lavelli and Mac Speedie, Cleveland won the championship again in 1948, posting a perfect 14–0 record and beating the Buffalo Bills in the title game. Another championship followed in 1949, but the AAFC then dissolved and the Browns, along with two other teams, were absorbed by the NFL. Helped by a strong offensive line including Agase, center Frank Gatski and tackles Lou Groza and Lou Rymkus, Cleveland won the NFL championship in 1950. The team reached the NFL championship in 1951 but lost to the Los Angeles Rams. Cleveland lost 24–17 despite gaining more yards and more first downs than the Rams. "It was a very disappointing loss", Agase later said. "We weren't quite as sharp as we normally were on offense." Before the 1952 season, the Browns traded Agase to the Dallas Texans, a newly formed team set to start play that year. He ended his playing career and signed as a line coach with the Texans under head coach Jim Phelan. The Texans finished with a 1–11 record and folded after the season. Agase came out of retirement briefly after the Texans disbanded, joining the Baltimore Colts and playing as a linebacker for the 1953 season. The Colts finished the season with a 3–9 record, placing fifth in the NFL West division. Agase was offered a job as an assistant coach for the Colts, but instead joined Iowa State University as its line coach in early 1954 on a $7,000-a-year salary. He and Iowa State head coach Vince DiFrancesca had played football together in high school. After two seasons at Iowa State, he signed as defensive line coach at Northwestern University. He worked under head coach Ara Parseghian, a former Cleveland teammate. In seven years under Parseghian at Northwestern, Agase rose to become the coach's top assistant. When Parseghian was offered the head coaching job at the University of Notre Dame at the end of 1963, he recommended Agase as his replacement. Agase got the job immediately after Parseghian left. Agase's first years as coach of the Northwestern Wildcats football team were unsuccessful. The team had losing records each season between 1964 and 1969. In 1970, however, the team finished with a 6–4 record, taking second place in the Big Ten Conference, and Agase was named the national coach of the year by the Football Writers Association of America. The Wildcats followed up with a 7–4 record in 1971, but fell to 2–9 in 1972. After nine seasons as the Northwestern coach, Agase accepted an offer at the end of 1972 to become head football coach at Purdue, one of the two schools for which he played. Taking the job was "not an easy decision to make", he said at the time, because he was happy at Northwestern. Agase coached at Purdue through the 1976 season, but his team never posted a winning record in his years there. He was fired in early 1977 and took a job as athletic director at Eastern Michigan University in Ypsilanti, Michigan. He stayed in that job until 1982, when he unexpectedly resigned citing "personal reasons". Agase remained active in college football by assisting Bo Schembechler as a volunteer at the University of Michigan until 1987, focusing on special teams. He was named to the Walter Camp Foundation all-century team in 1989 and the University of Illinois all-century team in 1990. Agase was inducted into the College Football Hall of Fame in 1963. While living in Tarpon Springs, Florida, Agase was an active member of George Young United Methodist Church, later renamed East Lake United Methodist Church. He died in 2007 at a hospital near his home in Tarpon Springs, Florida. 1 2 "Hall of Famer Spotlight – Alex Agase". College Football Hall of Fame. Archived from the original on October 9, 2012. Retrieved October 9, 2012. 1 2 3 "Alex Agase". College Football Hall of Famer. Archived from the original on October 9, 2012. Retrieved October 9, 2012. 1 2 3 "Alex Agase Dead At The Age Of 85". University of Illinois. Archived from the original on October 9, 2012. Retrieved October 9, 2012. 1 2 Hoff, Dave (October 10, 1942). "Alex Agase Big Factor In Victory". Youngstown Vindicator. Champaign, Ill. Associated Press. p. D1. Retrieved October 10, 2012. ↑ "Illinois Yearly Results". College Football Data Warehouse. Archived from the original on October 11, 2012. Retrieved October 11, 2012. 1 2 "Great Lakes Bows to Purdue, 23 to 13". The Milwaukee Journal. Great Lakes, Ill. Associated Press. September 19, 1943. p. 5. Retrieved October 11, 2012. ↑ "Purdue Yearly Results". College Football Data Warehouse. Archived from the original on October 11, 2012. Retrieved October 11, 2012. 1 2 3 "Alex Agase, College Football Standout, Is Dead at 85". The New York Times. Chicago. Associated Press. May 5, 2007. Archived from the original on October 12, 2012. Retrieved October 12, 2012. 1 2 3 Leone, Jared (May 6, 2007). "Ex-football coach Agase dies". Tampa Bay Times. Archived from the original on October 12, 2012. Retrieved October 12, 2012. 1 2 "Illinois' Alex Agase Rated Most Valuable". The Palm Beach Post. Chicago. Associated Press. December 15, 1946. p. 20. Retrieved October 12, 2012. ↑ "Illinois In the Polls". College Football Data Warehouse. Archived from the original on October 12, 2012. Retrieved October 12, 2012. 1 2 "Illinois Yearly Results". College Football Data Warehouse. Archived from the original on October 12, 2012. Retrieved October 12, 2012. ↑ "Dons Sign Alex Agase; Packers Had Rights". The Milwaukee Journal. Los Angeles. Associated Press. February 1, 1947. p. 7. Retrieved October 12, 2012. ↑ "Rockets Get Agase In Trade for Back". The Pittsburgh Press. Chicago. United Press International. September 17, 1947. p. 29. Retrieved October 12, 2012. ↑ "1947 Chicago Rockets Statistics & Players". Pro Football Reference. Archived from the original on October 12, 2012. Retrieved October 12, 2012. ↑ "Browns Get Agase in Trade for Lund". Cleveland Plain Dealer. May 22, 1948. p. 17. ↑ Piascik 2007, pp. 64, 81. ↑ Piascik 2007, pp. 141, 145. ↑ Piascik 2007, p. 181. 1 2 Piascik 2007, p. 233. ↑ Piascik 2007, p. 234. ↑ "Agase Gets Job As Dallas Coach". Cleveland Plain Dealer. May 13, 1952. p. 24. ↑ "Agase Mentioned For Huskies Job". Toledo Blade. Seattle. Associated Press. February 16, 1953. p. 18. Retrieved October 12, 2012. ↑ "1952 Dallas Texans Statistics & Players". Pro Football Reference. Archived from the original on October 12, 2012. Retrieved October 12, 2012. ↑ Sauerbrei, Harold (September 6, 1953). "Ex-Browns Start On Colt Defense". Cleveland Plain Dealer. p. 3C. ↑ "1953 Baltimore Colts Players & Statistics". Pro Football Reference. Archived from the original on October 12, 2012. Retrieved October 12, 2012. 1 2 "Alex Agase Hired to Staff at Iowa State". The Milwaukee Journal. Ames, Iowa. United Press International. February 3, 1954. p. 2. Retrieved October 12, 2012. 1 2 "Iowa State Line Coach Will Leave". The Daily Reporter. Evanston, Ill. Associated Press. January 20, 1956. p. 6. Retrieved October 12, 2012. 1 2 "Agase Reported Top Choice To Replace Ara". Times Daily. Chicago. Associated Press. December 16, 1963. p. 8. Retrieved October 12, 2012. ↑ "Ara Accepts; Aid Gets Wildcat Job". The Milwaukee Sentinel. Chicago, Ill. United Press International. December 18, 1963. p. 2. Retrieved October 12, 2012. 1 2 3 4 "Alex Agase Records by Year". College Football Data Warehouse. Archived from the original on October 12, 2012. Retrieved October 12, 2012. ↑ "Wildcats' Agase 'Coach of Year'". Palm Beach Post-Times. Des Moines, Iowa. Associated Press. January 10, 1971. p. E5. Retrieved October 12, 2012. 1 2 "Agase to coach Purdue". Tri City Herald. West Lafayette, Ind. Associated Press. December 18, 1972. p. 21. Retrieved October 12, 2012. ↑ "Eastern Is Expected To Sign Agase". The Argus-Press. Detroit. Associated Press. February 9, 1977. p. 16. Retrieved October 12, 2012. ↑ "Agase Resigns As Eastern AD". Ludington Daily News. Ypsilanti, Mich. Associated Press. May 7, 1982. p. 8. Retrieved October 12, 2012. 1 2 "Former Northwestern Coach Alex Agase Dies at Age 85". CBS College Sports. May 3, 2007. Archived from the original on October 12, 2012. Retrieved October 12, 2012. ↑ Markus, Robert (June 22, 1990). "Illini Football Centennial Celebration Hits The Road". Chicago Tribune. Archived from the original on October 12, 2012. Retrieved October 12, 2012. Piascik, Andy (2007). The Best Show in Football: The 1946–1955 Cleveland Browns. Lanham, Maryland: Taylor Trade Publishing. ISBN 978-1-58979-571-6. Pound sign (#) denotes interim athletic director.